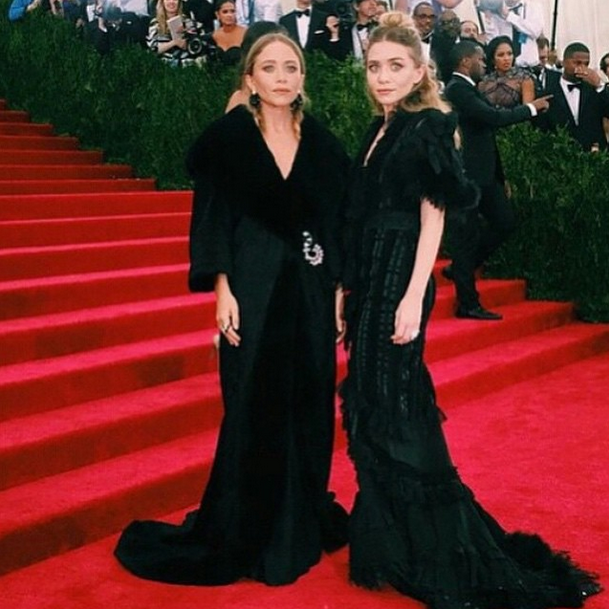 Dove Celebrity Hair Stylist Mark Townsend styled the gorgeous Mary Kate and Ashley Olsen for tonight’s Met Gala… or, more officially named: ‘China: Through The Looking Glass’ Costume Institute Benefit Gala at the Metropolitan Museum of Art ~ May 4, 2015 in New York City. Below is the breakdown of their simple yet sophisticated bohemian hair styles directly from Mark himself via his personal Instagram photos getting them ready so you can recreate them for yourself. “Ashley told me several days ago that she wanted to wear her hair half up and was also thinking about gold hair accessories – that got me extremely inspired! * To create the look, I started by applying a few drops of Dove Youthful Vitality Silk Crème to her damp hair and let it dry naturally while she had her makeup done. * When her hair was dry, I gathered the top section of her hair and pinned it into a topknot. * Then, I took the hair from each side and pulled it up and wrapped the hair around the base of the topknot, purposely letting the gold bobby pins and hair pins show because they are such a great effect to a simple style – I got them at Sephora. * Next, I used R Session Tools double barrel iron to create loose waves in the hair that was left half down. * I finished by liberally spraying Dove Style+Care Invigorating Dry Shampoo throughout the hair for texture and hold. * To start, I applied a few drops of Dove Youthful Vitality Silk Crème to her damp hair and blow dried with a round brush. * Lastly, I loosely braided each side and secured with an elastic. This entry was posted in Beauty and tagged hair styles, Metropolitan Museum of Art.